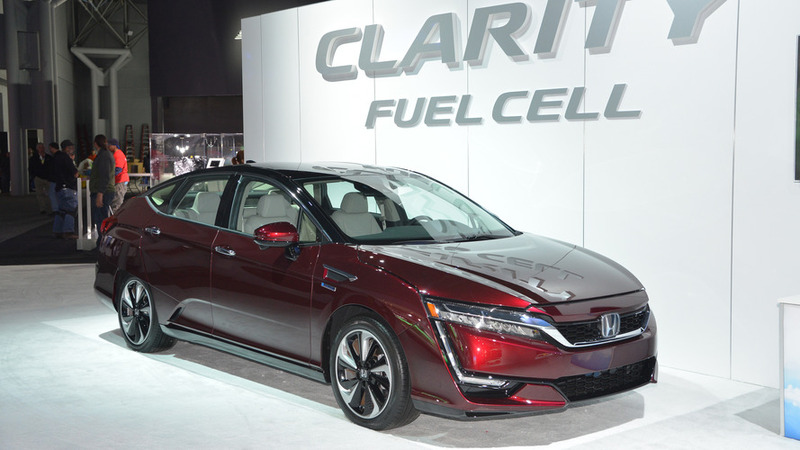 Honda has introduced this week in New York the 2017 Clarity Fuel Cell U.S. Spec which will be available for retail leasing before the year’s end. With a design that let’s just say takes some time getting used to, the new hydrogen-powered Clarity is replacing the FCX Clarity and comes with a significantly more efficient hardware. Even though the fuel cell stack has shrunk by a third, the power density is up by 60% and Honda anticipates this will grant an EPA-certified range of more than 300 miles (482 kilometers). One of the biggest assets of fuel cell cars is represented by the short refill time, in this case of only 3-5 minutes which is only a little bit more than a gasoline or diesel vehicle. Honda says the more compact fuel cell and integrated powertrain are the size of a V6 and as a consequence the hardware now fits underneath the hood. This has created a substantially roomier interior cabin that can comfortably seat five people. Honda has already commenced deliveries at home in Japan and the first one to get the car was none other than the local Ministry of Economy, Trade and Industry (METI). In United States, the 2017 Clarity Fuel Cell will be available in California only as a retail lease towards the end of 2016. It is expected to carry a starting price of approximately $60,000 and will be offered with a monthly lease of less than $500.